Way back in the 1960’s, record producer Phil Spector created the “wall of sound”. Listen to a Crystals or Ronettes song and you will hear it. Tonight, Date Night goes to a place that has created the “Wall of Beer”. Have we found restaurant nirvana? We are at The Pub because we are attending their pre-opening party. 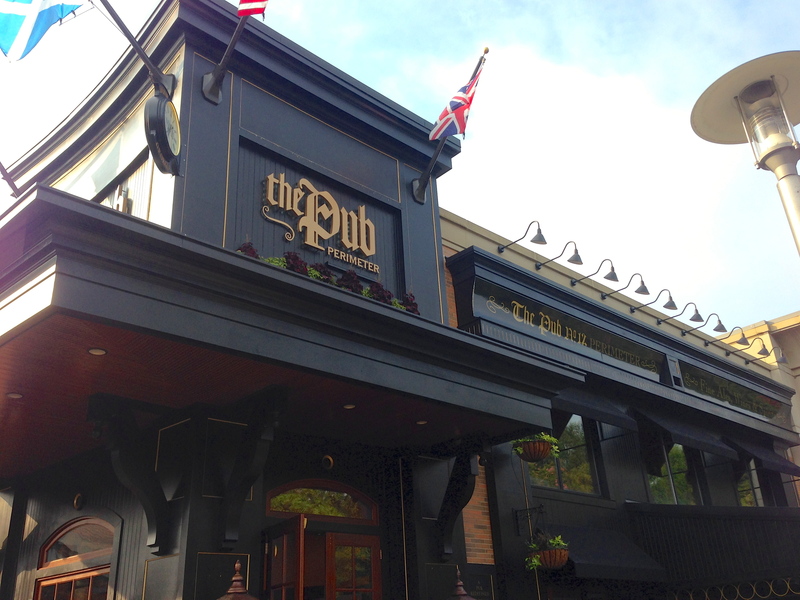 The Pub is located at the front entrance of Perimeter, right between the Cheesecake Factory and Maggiano’s. What a great location. We think this used to be a Hudson Grille. Like the preceding restaurants, this is a chain. This is their 12th location and the first in Georgia. There’s lots of wood and they spent a lot of money on the space to give it an air of “British hospitality with an American flair”. The bar is gorgeous. Friends and family are eating downstairs to give the kitchen and staff a “dress rehearsal” for the official opening on Monday. 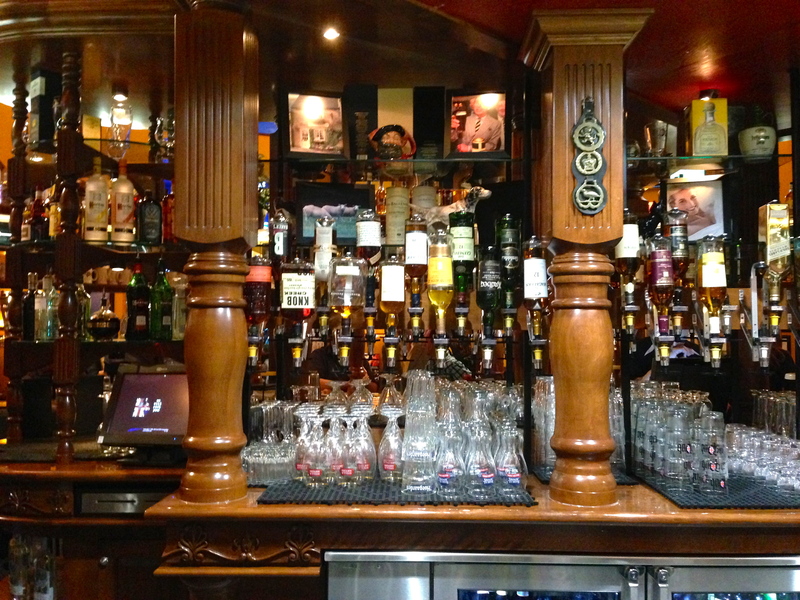 Servers, both male and female wear kilts at The Pub. We didn’t ask if the guys are wearing underwear. The real star of the show at The Pub is located upstairs. Or you can pour in large glasses. The beer costs 34 cents an ounce, no matter the alcohol level. A full pour costs about $5. We made this beauty ourselves for Malika of the Atlanta Restaurant Blog. 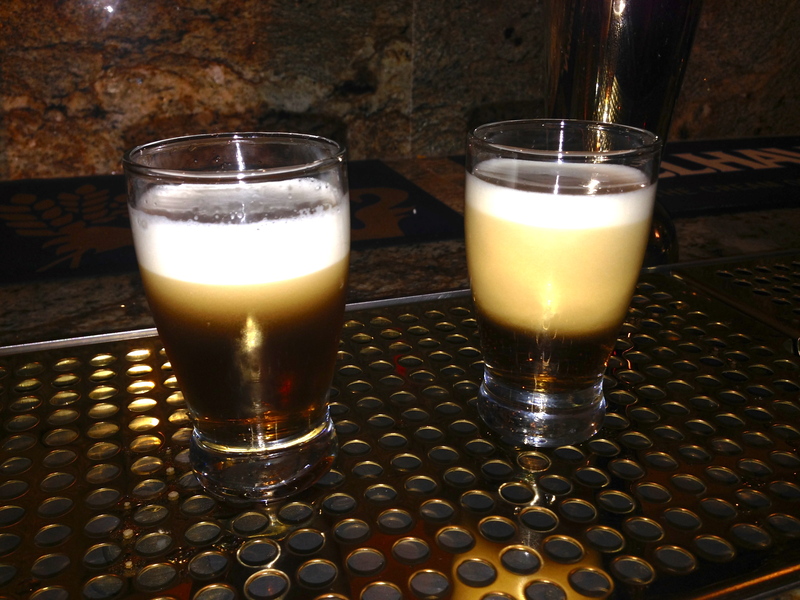 Date Night calls it a “Dirty Ho” and the more politically correct Pub calls it a “Bumble Bee”. 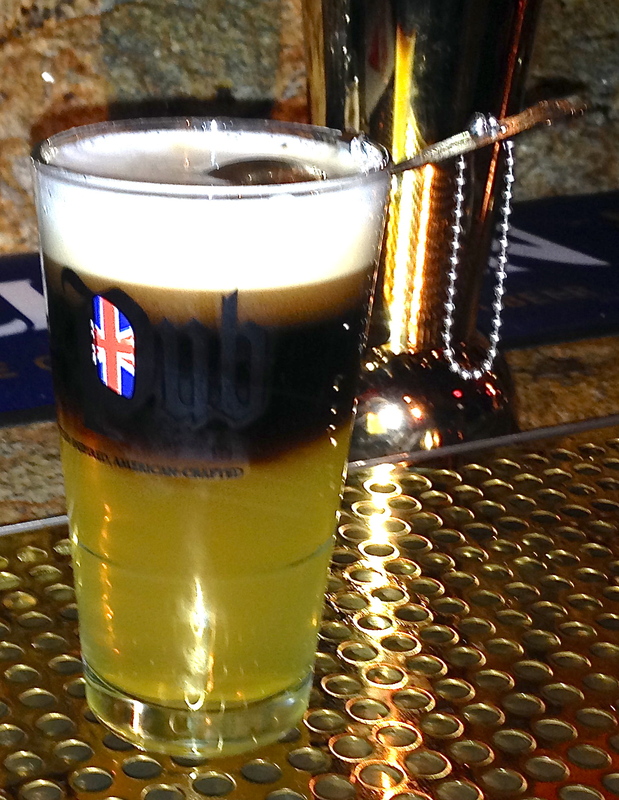 Whatever you call it, it’s a “Black and Tan” made with Guinness and Hoegaarden instead of the usual Bass Ale. 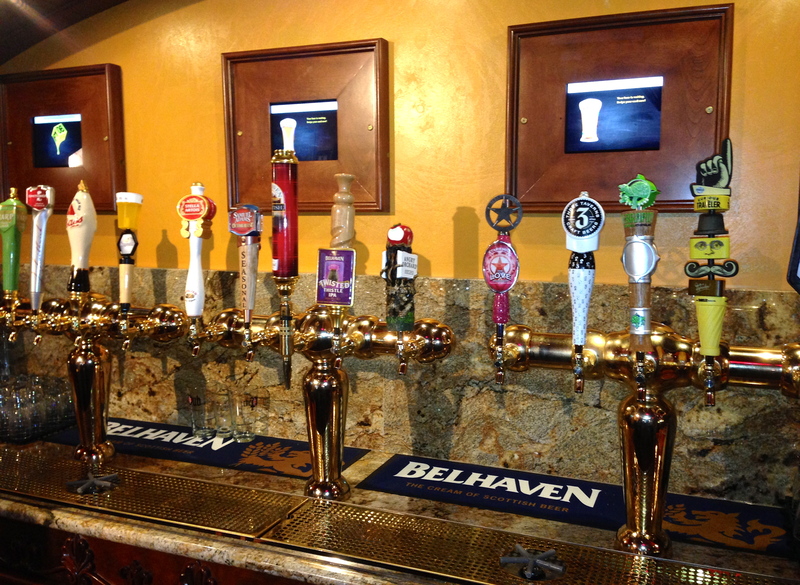 Don’t miss the Wall of Beer if you visit. 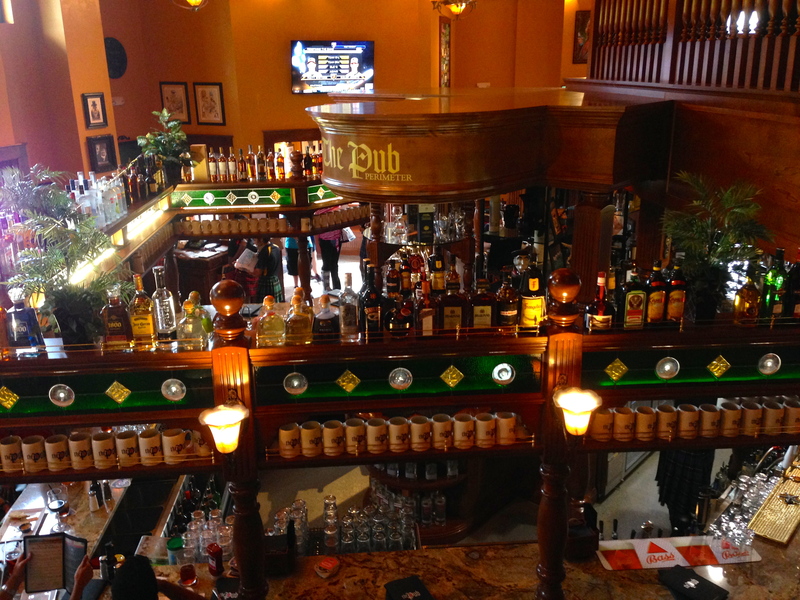 In fact, get your table and go directly upstairs for your drinks. With our beer, we are eating “shareables” from a buffet table. 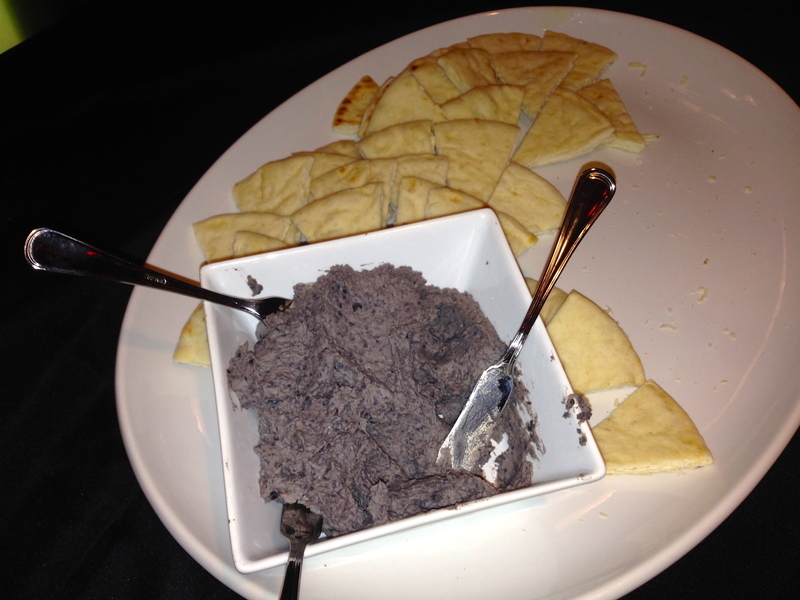 The black bean hummus comes on pita bread. It actually appears on the sandwich side of the menu. I liked it, but Eve didn’t care for the texture. She liked this dish a lot better. 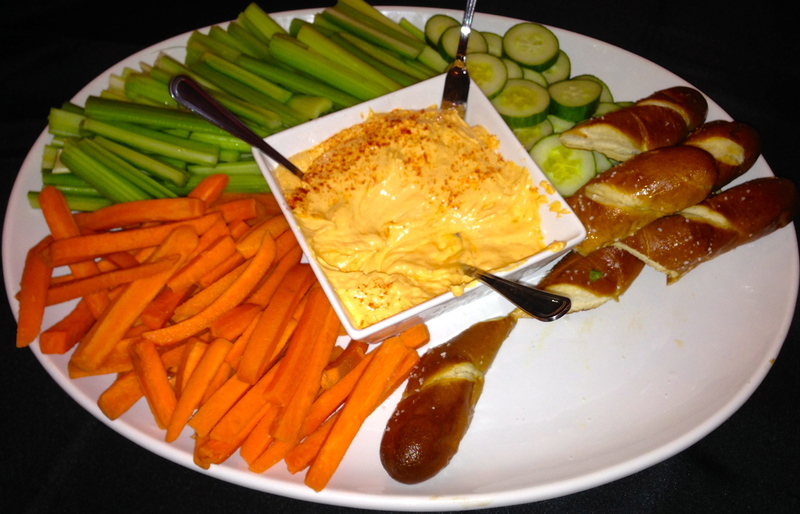 The Belhaven Beer Cheese comes with pretzel bread and veggies. 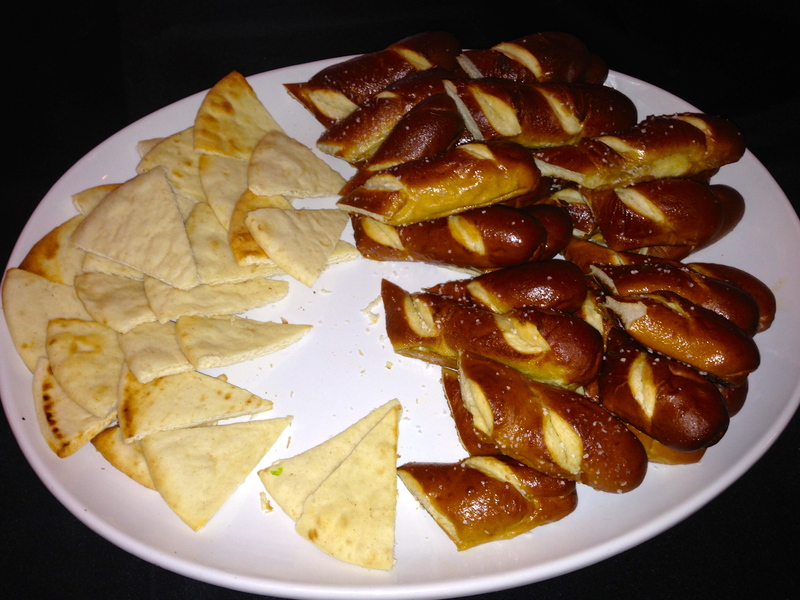 The beer-infused cheese goes great on that pretzel bread. Doesn’t everything go great on pretzel bread? 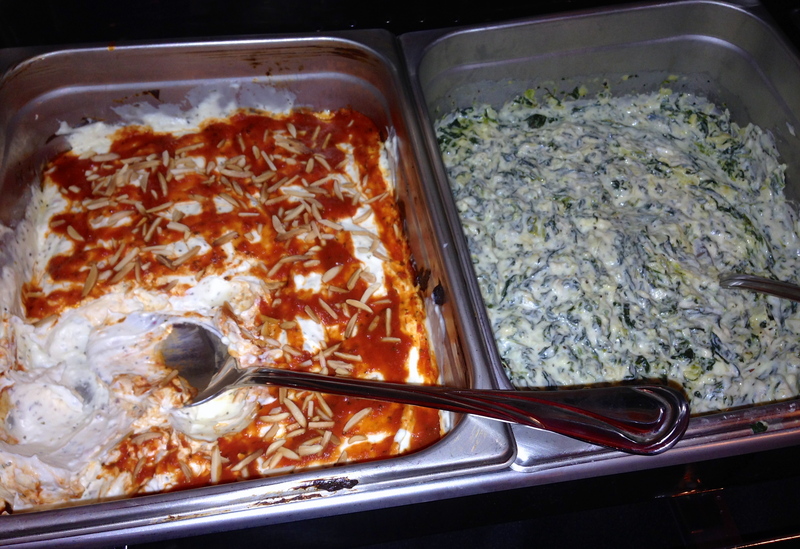 The goat cheese dip and the spinach artichoke dip are both served with pita on the menu. Eve doesn’t usually care for goat cheese, but she gives this dip two thumbs up. I put them all over the pretzel bread. Don’t tell! How’s this for presentation? Terrible! Not to worry, I made this myself. Don’t show it to the chef. 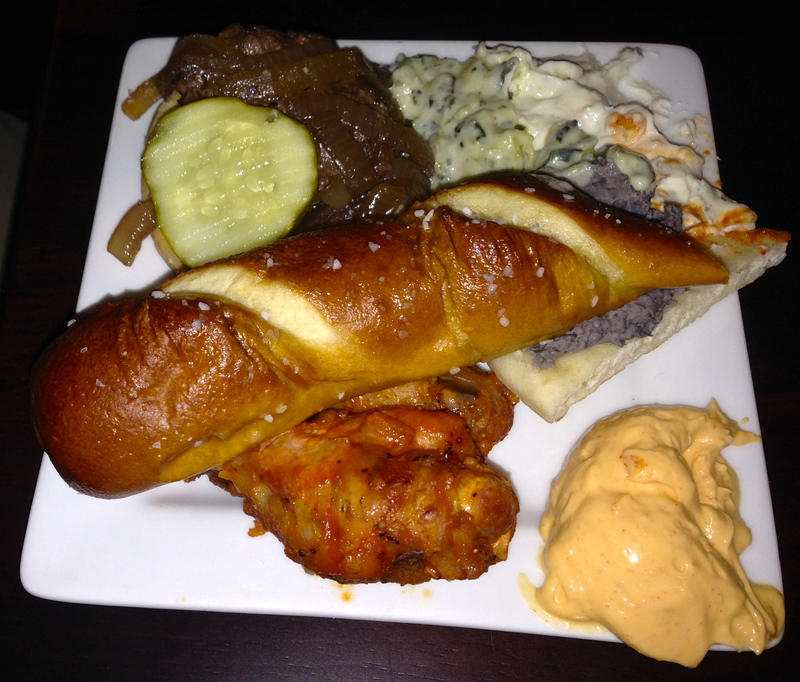 It gives you a peek at a couple of other things we tried, the Pub Wings and the Pub Sliders. The wings were not too spicy (that’s good in our eyes) and the sliders had Guinness braised onions on them. I am not an onion fan, but when cooked in Guinness, why not? 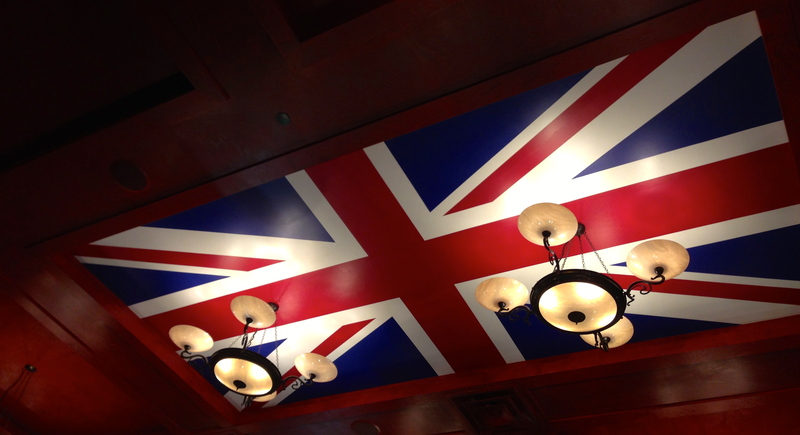 There are burgers and British comfort food like shepherd’s pie, bangers and mash, and fish and chips on the menu as well. Unfortunately, we didn’t get to sample any of the main courses. We can assure you we will go back to investigate. 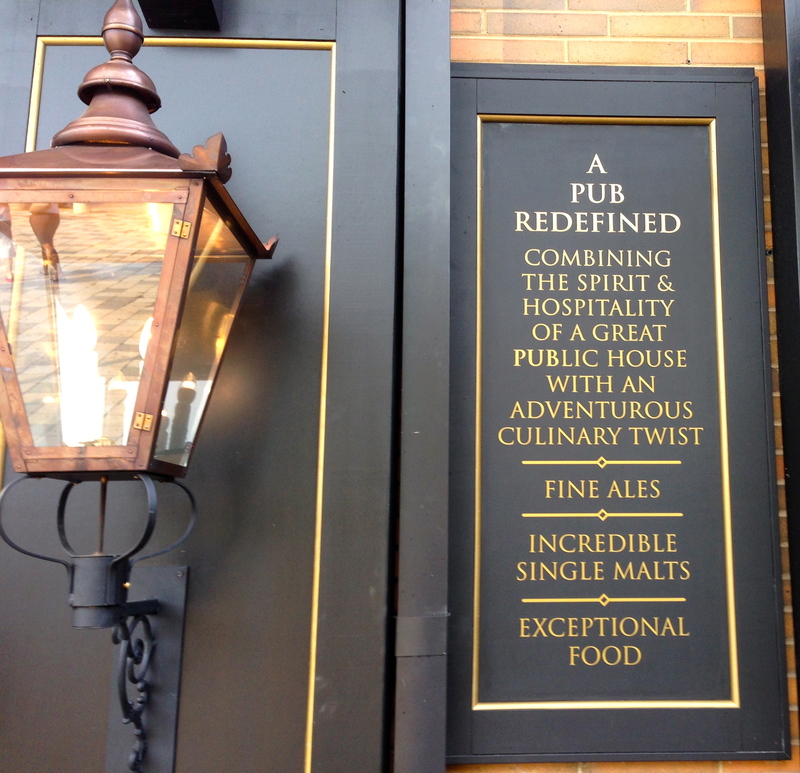 The Verdict: The Pub has some of the friendliest staff we have ever encountered, especially in this area of the city. We have no idea where they find these people, but everyone has a smile on their face and they all believe in what they are doing. The beer list is amazing and the drink list looks strong if you like your drinks made by a mixologist. We had a lot of fun here and really enjoyed the relaxed neighborhood vibe, even though we were in a mall. We look forward to our next visit where we can sample some more of the menu. Disclaimer time: Because this was a pre-opening event, we did not pay for our food or drinks. Our opinions, however, are priceless.